The planet Raguy was once a beautiful place, until the evil Daruma tribe invaded, bringing pollution that corrupted the land. You, as Blue, are a specialist of the Leaf Dump, and you love Princess Fa of the Raguy family. Unfortunately, Princess Fa has fallen sick from the pollution. It's your job to save your princess in Blue's Journey, a 2D side-scrolling platformer with RPG elements. Go through stages jumping on platforms and avoiding traps, while dealing with a multitude of bad guys, with a special bad guy boss at the end of every level to defeat with special means. To help with this, Blue can use a leaf attack and shrink. The leaf attack, only used when Blue is full sized, lets Blue slam a leaf that stuns any enemies he hits. Blue can also pick up power-ups for a more devastating leaf attack, or change his attack entirely. When the enemies are stunned, Blue can pick them up and throw them across the screen to dispose of more baddies. Shrunken down Blue can't use his attacking power, but he can fit into small crevasses and crannies not normally accessible. Of course, Blue can also dispatch enemies by jumping on them. Since Raguy's economy is flower based, Blue can collect flowers to buy things at special huts. But Blue must take care not to fall into traps or bottomless pits, which cause instant death. Being hit by bad guys or their shots is just as bad. Blue starts the game with two hearts, losing one when he gets whacked by a bad guy. When his heart count goes to zero, Blue dies. Play the game alone (as Blue), or with your friend (as a green Blue) for two-player simultaneous fun. 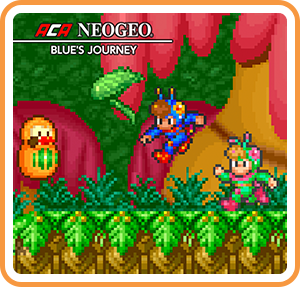 Where can I buy ACA NEOGEO BLUE'S JOURNEY physical/digital?